It is no secret that the debate over the nation of Israel’s claim to the city of Jerusalem has caused great controversy. While many who support the rights of the Jewish people present compelling emotional appeals, most fail to substantiate their arguments with hard evidence. To truly defend Israel on the political front will require more than emotional outcry; we must explore the legal and historical facts surrounding this conflict in order to preserve the rights of the Jewish people. Dr. Cynthia Wallace uses her thirty years’ experience in the field of international law to delineate the legal and political rights of the nation of Israel as well as the ramifications of the proposed Palestinian state. Using a compre-hensive approach, Dr. Wallace presents compelling evidence authenticated by the community of nations to establish Israel’s rightful legal claim to its capital and most holy city. Cynthia Wallace provides one of the clearest, most succinct and compelling explanations of Israel’s right to its land that I have read. She sheds light on the Israeli-Palestinian issue here too often rhetoric and half-truths have obscured the legal and historic right of the Jewish people to a homeland. Nations and individuals need to know the history before they make historic decisions. Wallace provides it. I believe it’s a profound contribution to the world-wide dialogue that should be read by diplomats, journalists and decision makers as they deliberate on the pressing issue of our time. Dr. Cynthia Wallace has put together a most important book on the foundational rights for Israel’s existential privilege in Jerusalem and the land once known as “Palestine”. These foundational rights extend beyond just ‘humanitarian’ considerations, being firmly moored in the underpinnings of international law. This book should be required reading for political representatives and concerned citizens of any nation that desires to justly pursue resolution of the seemingly unending territorial disputes between Israel and the Palestinians. While Dr. Wallace’s contribution does not pretend to be a “road map for peace”, without the relevant legal comprehension there can be no “road map for peace”. As we pray for God’s ancient, firstborn People, the Jews, and for the peace of Jerusalem, it is important that we also understand the international legal foundations underlying the key issues at stake. Dr. Cynthia Wallace, who personally is deeply rooted in Scripture, has as well a long academic career in international law. She has provided the global community a most valuable and extremely well documented resource to help us understand these critically timely issues like few others could. Dr. Wallace does not stop there, but also looks beyond overused catchy headlines in order to “decode” the cleverly worded media rhetoric and uncover truths relating to the ‘core’ issues—both historically and legally—in a way that leads to practical as well as spiritual support of Israel. This is an approach that many who have wanted to do more for Israel in practical terms have been waiting for. This work is a spark of truth that will light a torch of justice. There are few issues that are more neglected, misunderstood and misrepresented in the international debate arena than Israel´s rights in the disputed territories. Whereas much attention has been given to the plight of the Palestinian people, little appears to be truly understood about Israel´s rights to what are generally called the “occupied territories” but what really are “disputed territories.” Dr. Cynthia Wallace and the European Coalition for Israel have done a great service to those who are truly interested in the facts and not only fiction and myths, by presenting a clear legal perspective on this important issue. A final and comprehensive peace agreement in the Middle East can only be built upon historical facts and legal foundations. Through her well-researched and clearly presented document, Dr. Wallace has significantly contributed to a common understanding grounded in history and international law. As a respected international lawyer with a PhD from Cambridge University, Cynthia Wallace has lectured around the world. But her most important appearances have been in the courts of heaven. For more than a decade, she has led weekly intercessory Breakthrough Worship gatherings in Switzerland, most recently in a 700-year-old church over-looking the Lake of Geneva. There, she and the small prayer team that has joined her have learned how to tune in more closely to the heart of God, interceding for their city, Israel, and the nations of the world. Sharing her own journey of discovery and delight, Dr. Wallace reveals some of the ways she has grown in her understanding of how to seek and sustain God's presence and prophetic power. Reading her story, you will be inspired to pursue a similar encounter, learning ** the difference between passive and active worship ** how to prepare your heart ** the importance of unity, and ** what can keep you from greater spiritual intimacy. Offering principles rather than rules, and urging joy rather than duty, Dr. Wallace invites you to join her in the adventure of becoming an advocate before the eternal judge. 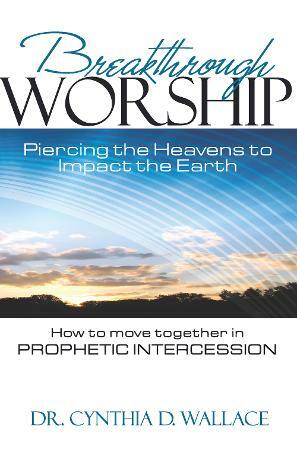 Precious Cynthia, I do have your newest book Breakthrough Worship – it’s the one that, as I mentioned to you in an earlier email, the Lord told me about on March 3rd (twelve days before I received your message). I thought it was interesting that He told me about it even before I had a chance to hear about it from you and He was SO excited about it!!! I went onto Amazon.com the very day He told me about it and purchased a copy, read it and enjoyed it immensely. It’s a wonderful book that totally captures the heart of God – and it captured mine, as well.